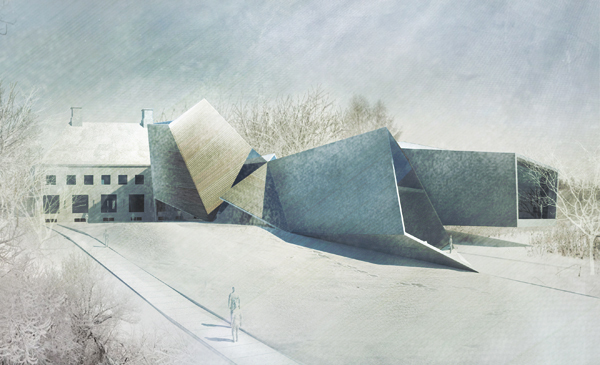 The project for the expansion of the Serlachius Museum Gösta, presents an opportunity to explore a creative relationship between the existing museum and the surrounding landscape. Through a new and distinctive poetic architectural language, where the interior unfolds as a sequence of spaces, the project develops a harmonious ensemble that blurs the boundaries between existing and new. 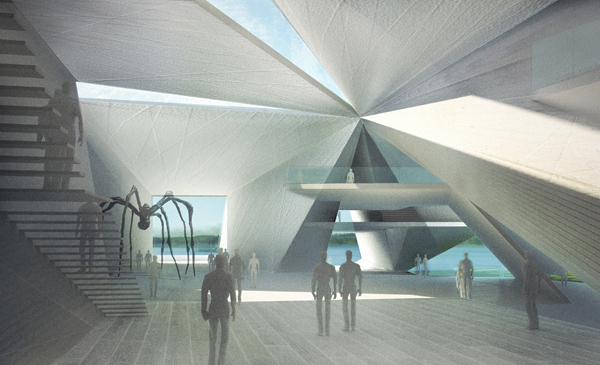 The proposed extension will allow the museum to develop a unique cultural environment, integrating the aesthetic, functional, and economic goals of a larger and more varied institution through an extended programme of activities. Importantly, it will introduce a new informality through a series of fluid volumes that establish an exciting relationship between the house, the existing grounds and the landscape beyond. 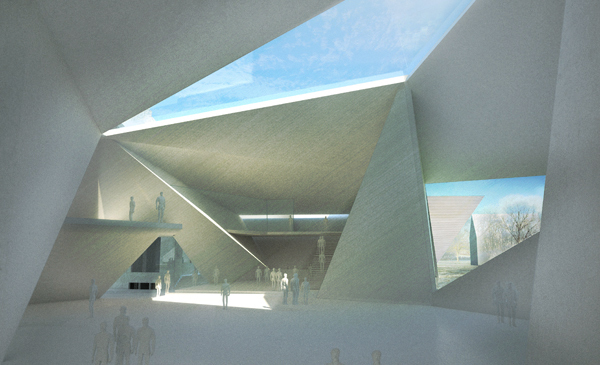 The project will provides an entrance and orientation space, the “heart” of the extended museum, that will lead to a series of dramatically lit flexible spaces for exhibitions, conferences, educational activities and other public events. 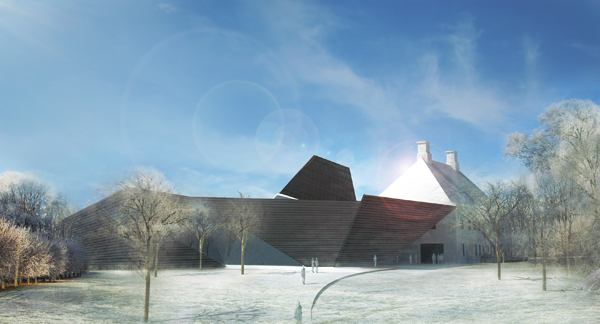 Gösta Serlachius’ extensive business interests in wood and paper processing supported his life-long passion and support of the arts; it is therefore through a reinterpretation of these two elements that the proposed extension expresses the pivotal role and influence of the Serlachius family. 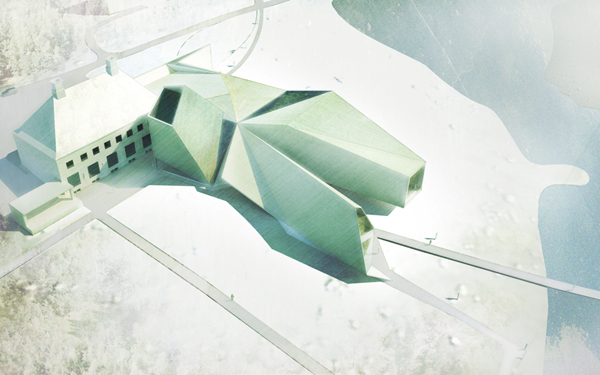 The form of the Serlachius house, especially the roof, is the template for the new building. The geometry of the roof planes are folded and cut in the manner of paper ori-gami “folding-paper” and kirigami “folded and cut shapes”, to develop a complex sequence of architectural spaces that slowly unfold to create a new layered experience. As in origami, the number of basic folds is small, but the evolving geometry results in a series of intricate shapes of surprising complexity. The nature of these is far removed from the walls and roof elements of a traditional building. Timber is the language of the proposed extension, not only as an expression in the Nordic tradition, but representing the bold angular beauty that defines the landscape, where invisible forces can theatricality shape both the interior and exterior. The structure and building envelope are expressed as a single component that can be manufactured from a variety of wood products to meet the geometrical tolerances of the structure and the capacity for snow loads. This integrated approach results in day lit column-free spaces that express a variety of unusual forms and volumes internally. Clad in bitumen-coated weatherboarding, the extension is punctuated by a series of external glazed fins that allow controlled daylight to illuminate internal surfaces, generating surprising and inspiring effects that changes through the seasons. Selected views of the landscape, the island and the lake are framed through openings in the new restaurant. 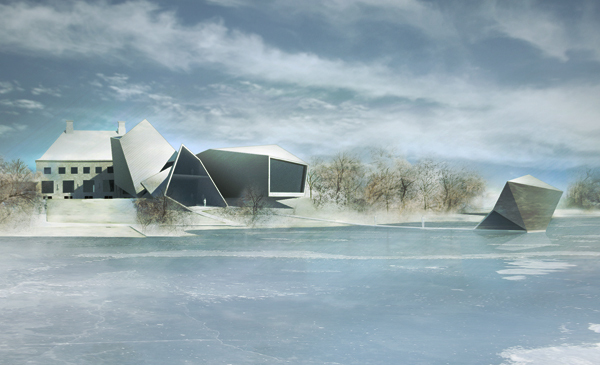 Interpreting the transition from land to water, the architecture will respond to each season through elements that transform to create new spaces. In the summer months the lakeshore deck is used for water-side activities. In the winter, it transforms into a transitional space for the sauna strategically placed in the lake.